Fortresses, bastions, citadels and other fortifications since time immemorial guarded the borders of Azerbaijani cities and khanates. It is impossible to count how many enemy attacks they repulsed and how many insidious plans of the enemy they destroyed. The destinies of the great Azerbaijani rulers are closely linked with many of these fortifications. The stories of these fortresses themselves were covered with legends over centuries. We present only some of the Azerbaijani fortresses that left a bright trace in the history of statehood of the country. There is a fortress on the right bank of the river Agchay, 7 km from the regional center and 4 km from the village of Talystan - one of Ismayillovs’ oldest settlements. There are traces of four ancient settlements and five cemeteries in the vicinity of the village. The first archaeological excavations here were carried out in the 1960s, as a result of which it became clear that this territory has at least a 2,000-year history. Having reached the village by car, further the fortress can be reached only by horseback or on foot. This powerful defensive system of the early Middle Ages consists of the outer and inner parts (ichgala). The width of the southern wall of the main part reaches 2 meters, height 10 meters. Ichgala, an area of 2 hectares, was erected on the very top of the cliff. It is believed that the defaulted were dropped from this cliff down into the abyss. There was an underground tunnel leading from the Fortress to the Maiden Tower, located at a distance of 7 km from it. Over time, the tunnel collapsed, but some of its parts have survived to this day. There is a waterfall, surrounded by a dense forest, on the territory of the fortress, which today is an ideal place for a picnic. Located in the upper north-eastern elevated part of the city, the Sheki fortress was built during the reign of the first Sheki Khan Haji Celebi (1743-1755). The fortress is a khan's citadel, and the construction of city-wide use is not included in its features. The location of the fortress is successful not only from the military-strategic point of view, but also due to the favorable microclimate of this part of the city territory. The total length of the fortress walls is 1,300 m, the height of the northern wall is 4 m, the southern wall is 8 m, with the wall thickness of 2.2 m.
From the southern and northern sides the fortress has two gates and defensive towers. 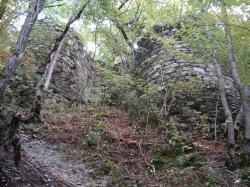 During the Soviet period, the destroyed parts of the fortress were restored. In different periods of time, there were many buildings inside the fortress, the number of which reached forty. The main among them is the unique palace of Sheki khans, built in 1762 without a single nail. The fortress of Gelsersen - Gerersen (Come and See), one of the most famous historical sights of Sheki, is located on a strategically advantageous site, about 4 km to the north of the city, on the left bank of the upper stream of the Kish River, on the top of the Garatepe mountain. It is assumed that the foundation of the fortress was laid in the 15th century by the Sheki ruler Alidjan. The name of the fortress is connected with the invasion of Sheki of the ruler of Iran Nadir Shah. In 1743, taking advantage of the people’s discontent with the Iranian oppression, the ruler Haji Chelebi, declaring himself a Sheki Khan, took refuge in this fortress and rejected Nadir Shah’s demands to surrender. Answering to Nadir Shah’s question on why he does not surrender, Haji Chelebi, confident of the inaccessibility of the fortress, says “come and see”. Indeed, in 1744 Nadir Shah with a huge army arrives in Sheki, coming to the fortress, but, unable to take it over, returns back. After this event, the name of the fortress was established as Gelersen-Gorersen among the people. There are many deep wells on the territory of the Fortress. In some versions, these were traps for enemies. There is also a version there was an underground passage under the fortress. 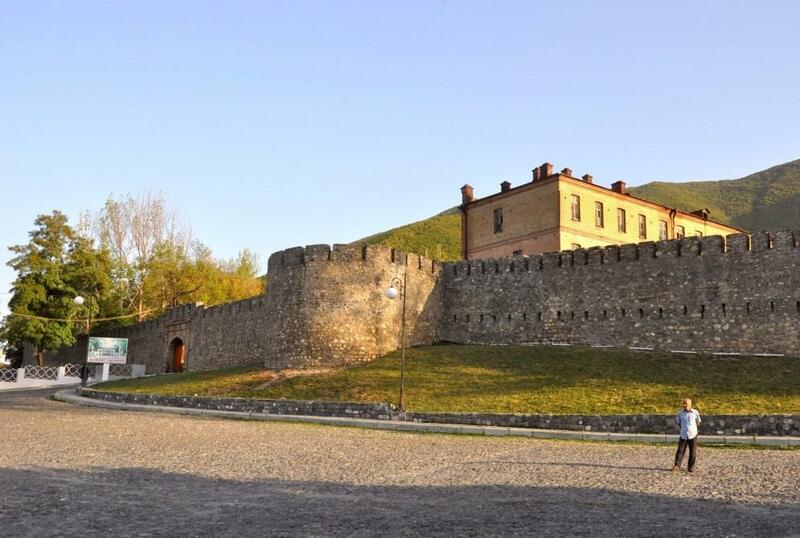 Today, the fortress is a must-see place for all tourists who come to Sheki. Amazing panorama of the natural scenery opens up from the fortress walls: majestic mountains covered with emerald forests and a serpentine running along the Kish River. If you come here in September, you will be able to taste a ripe dogwood, which grows in abundance around the fortress. The ancient Ganja has an extremely rich and interesting history, imprinted in numerous architectural monuments, one of which is the Ganja fortress. 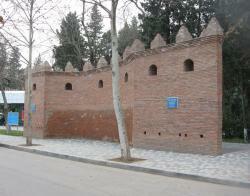 Fragments of its powerful walls can still be seen on the territory of the oldest urban park "Khan Bagi". The famous Ganja fortress known as the ‘Shield of all Asia’ was built in 1588 by the commander of the Turkish army in the Caucasus Farhad Pasha on the orders of the Turkish sultan Murad III. Mainly local river stone and clay were used in the construction of the fortress. The south-western, north-western and eastern walls of the fortress were fortified to the greatest extent, with the help of a red brick used in the construction along with the river stone. About 30 defensive towers were erected every 200-500 m along the wall. In the late 16th and early 17th centuries, the Ganja fortress was divided into four parts: the outer city, Shahristan, Ich-gala and Narin-gala. After joining Russia, according to the new plan of the city prepared by the architect Ignatii Ivanovich Krzhntalovich and signed in 1873 by Alexander II, the historical part of the city was subjected to significant changes. The fortress was destroyed, and blocks of the European model were built in its place. 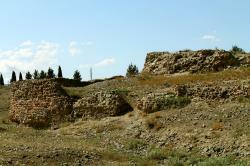 Only one fragment of the fortress walls, which is now called “Shiralibek Tower” survived. By the way, you can still see the dilapidated remains of the wall of the ancient Ganja fortress on the approaches to Ganja along the banks of the Ganja-chai river. Now only formless fragments of this fortress remain. Water, guarding the approaches to the fortress, undermined the stones, and the building fell into decay. The legendary fortress of Gulistan in Shamakhi is one of the greatest monuments of Azerbaijani statehood. It got its name from the picturesque area in which it was located ("Gulustan" means "flower garden"). Built in the 8th-9th centuries at the top of a 200-meter high rocky mountain in the north-west of Shamakhi, this powerful fortress for nine centuries served as one of the main strongholds of the state of Shirvanshahs. 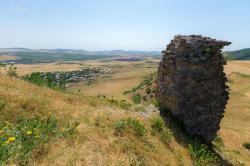 For its inaccessibility, the fortress of Gyulistan was popularly known as the Maiden Fortress (“Giz Galasi”). 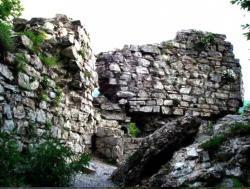 During the foreign invasions the inhabitants of Shamakhi for centuries found protection within the walls of the fortress. The territory of the fortress Gulistan was surrounded by powerful walls with numerous round and quadrangular towers. A winding road led from the lower part of the fortress to the citadel at the top of the mountain, girded with a solid ring of fortified walls. The fortress existed until the end of the 16th century. Its structure was badly damaged not only by wars, but also by numerous earthquakes, and only its ruins have reached us. They can be seen at the entrance to Shamakhi, as evidence of the city's rich historical past. From the top of the hill, where the ruins of the fortress are located, a breathtaking panorama of the city and its surroundings opens. The ancient fortified city Alinjagala was erected in a stepped form on the slope of Alindja Mountain in Nakhchivan. The fortress was mentioned starting the 6th century in written sources, the oldest of which is the epic “Kitabi-Dede Gorgud”. Some researchers believe that the fortress was built 2000 years ago. Once this mighty fortress was the residence of the ruler of Nakhchivan, Zahid Khatun. During the reign of the Eldeniz dynasty, the state treasury was kept in this fortress. The massive walls of the citadel were built of burned bricks and large stones. During the Atabeys state, reservoirs for water and fortress towers were built in order to strengthen the defense in Alinjagala. The steep slope of the rock and the powerful walls of the fortress made it an impregnable defensive fortification for a long time. Currently the fortress of Alinjagala is open for visiting. However, in order to get to it and enjoy the beautiful panorama, you need to overcome two thousand steep stairs.